CARFAX 1-Owner, ONLY 4,454 Miles! GX 460 Luxury trim. Sunroof, Navigation, Heated Leather Seats, 3rd Row Seat, Rear Air, Heated Rear Seat, DRIVER SUPPORT PACKAGE W/MARK LEVINSO... Alloy Wheels, 4x4. CLICK NOW! Leather Seats, Third Row Seat, Navigation, Sunroof, 4x4, Rear Air, Heated Driver Seat, Heated Rear Seat, Cooled Driver Seat, Back-Up Camera, Running Boards, iPod/MP3 Input, Onboard Communications System, Aluminum Wheels, Keyless Start Rear Spoiler, MP3 Player, Keyless Entry, Privacy Glass, Child Safety Locks. DRIVER SUPPORT PACKAGE W/MARK LEVINSON AUDIO crawl control, Driver Attention Monitor, wide-view front and side camera monitor system, Mark Levinson Premium Surround Sound Audio, 330 watts of power, 17-speaker Mark Levinson, 7.1 Channel Architecture, Automatic Sound Levelizer and Bluetooth hands free phone and phonebook download capabilities and music streaming, Radio: AM/FM Stereo w/CD/DVD Player, Pre-Collision System, all speed dynamic radar cruise control, Auto-Dimming & Power-Folding Exterior Mirrors, mirror indicator, Lane Keeping Assist System, Intelligent High-Beam Headlamps, smart beam. 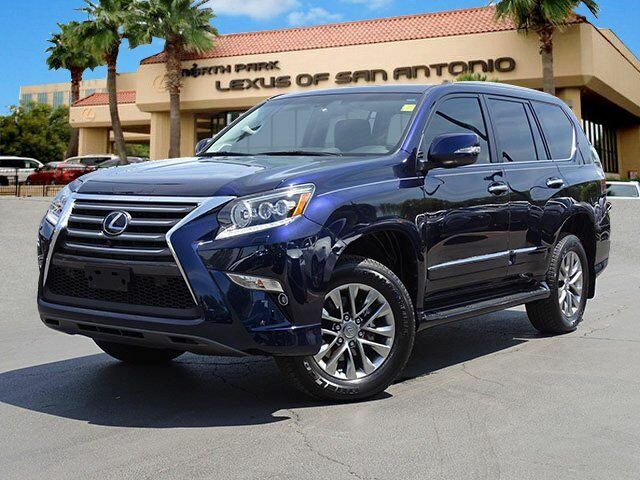 Lexus GX 460 Luxury with NIGHTFALL MICA exterior and BLACK interior features a 8 Cylinder Engine with 301 HP at 5500 RPM*.